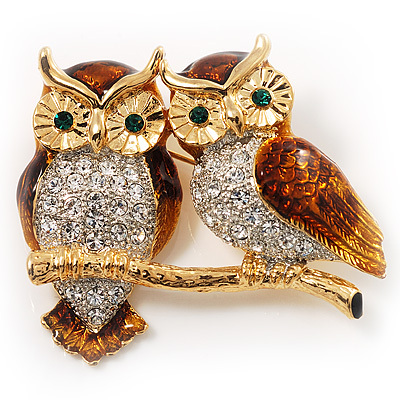 Soar with sophistication when you wear this Two Gold Crystal Sitting Owls Brooch. Fashioned from gold tone metal, this brooch showcases two adorable owls sitting on a branch. They covered with brown enamel detailing and accented with clear crystal rhinestones on the body, for a dash of sparkle. The highly detailed "eyes" complete the brooch with emerald green stones. It measures about 35mm x 35mm and and fastens with a flag pin and revolver clasp.